« From Low $600’s > North Vancouver LODEN GREEN Townhomes in Maplewood Community Now Previewing! Live close to water, city and mountains! NOW SELLING! 38 modern brick residences along East Hastings Vancouver OXFORD Condos features 1, 2 and 3 bedroom homes with quality finishes and distinctive details in an enviable East Vancouver location! Best of all, The Oxford Vancouver condos start from the low $200’s, making them some of the most affordable residences in the city. The presentation centre or The Oxford East Hastings condos is at 2137 East Hastings Street Vancouver BC. The development is brought to you by the AIREY Group and ALLAIRE. Visit www.liveatoxford.com for all the details including a list of quality interior finishes, floor plans, views and the neighbourhood story of East Village Vancouver East. 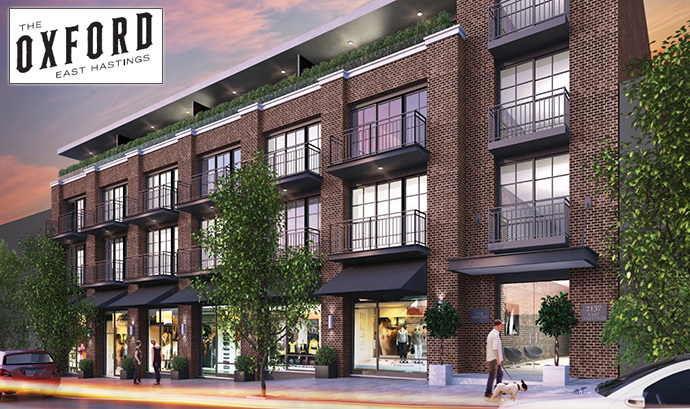 The Oxford East Hastings condos is a brand new offering in this historic community which brings a great blend of both historic and current design with a strong brick façade and traditional detail work that blends into this beautiful neighbourhood. The exterior architecture of the Vancouver Oxford East Hastings condos includes distinguishing brick that is timeless and low maintenance. There will be plenty of outdoor spaces including terrace decks and patios in most homes and many of the apartment residences will also feature incredible water, mountain and/or city views. The vibrant East Village Vancouver neighbourhood is home to many of Vancouver’s top ranked restaurants in addition to eclectic and boutique fashion designer stores. The Oxford Vancouver condos will also be just ten minutes away from downtown. The Oxford Vancouver East condos will also feature secured underground parking for residents in addition to easy ground floor bike storage space. All homes are backed by the Travelers 2-5-10 New Home Warranty. The classically modern interior finishes at these new Vancouver East apartments are spectacular in every way. There are two stylish colour palettes/finishing schemes to choose from as a presale home buyer that includes White and Soft Ash. The bedrooms have super soft carpets and all homes have stacked washer and dryer by Blomberg. The Oxford Vancouver condos will feature spacious living areas with functional layouts. The main living areas will have refined laminate in Meridian Oak or Brushed Oak with the ability to upgrade to wide plank engineered hardwood floors at the time of presale purchase only. The beautiful bathrooms will feature seamless glass shower enclosures with oversized stone white tiled surrounds as well as elegant Duravit two piece toilet and bathtub with polished chrome Grohe plumbing fixtures. Other bathroom features at the new Vancouver Oxford East Hastings apartments includes beautiful polished quartz counters with smooth stone tiled floors for an elegant look and feel. The chef inspired kitchens at The Oxford East Hastings include a stainless steel under mount sink with garburator, Euro style square edged cabinetry in Eucalyptus or Frosty White with modern hardware in addition to quartz counters and corresponding backsplashes in either Alpine Mist or Pure White for a truly sophisticate and modern feel. All of the homes at The Oxford Vancouver East Hastings condos except for the C Plan Studio Collection will feature the Gourmet Stainless Steel Appliance Package. This set includes a GE 24” integrated dishwasher, GE built in microwave, Perfekt Glide 30” hood fan, Porter & Charles 30” dual fuel range oven in addition to a Fisher & Paykel ActiveSmart 17 cubic foot fridge with counter depth bottom freezer. East Village Vancouver has a strong claim to being the city’s oldest and most authentic urban enclave. Today, it also has a claim to being the city’s most vital. The Vancouver East Village is a neighbourhood unlike any other, with a warm, inclusive vibe, and tons of character. These blocks boast destination food markets, craft and artisan shops, and restaurants that feature prominently on Vancouver’s food blogs, all standing along the character-rich, vibrant corridor of East Hastings. And the side streets are made for friends and summer block parties. All minutes from the downtown core. Welcome to the East Hastings Vancouver Oxford condos: affordable and central! A distinct collection of 38 modern apartment residences in an enviable East Vancouver location. One, two, and three-bedroom homes with quality finishes and luxury details that can’t be found nearby, developed by the Airey Group and Allaire Properties. Discover why many residents call this the best neighbourhood in Vancouver – and why The Oxford is the best way to live here. 38 modern residences above ground level retail is now launching at the new East Vancouver Oxford condo development offering a range of one to three bedroom floor plans, intriguing red brick exterior architecture with metallic accents and lots of high-end interior finishes. Luxury meets a trendsetting neighbourhood with prices starting from the mid $200’s. Coming soon to the fun’n’funky Vancouver neighbourhood, Oxford Vancouver condos is a collection of 38 mordern apartments above ground level retail. Located halfway between Nanaimo and Victoria Street, these new homes range from one bed to three bed and offer an intriguing red brick architecture with metallic accents plus plenty of upscale interior finishing details – luxury meets trendsetting neighbourhood at The Oxford Vancouver condos. Discover this secret Vancouver gem for yourself this June. Prices will start from the mid $200’s with priority registration now underway. DISTINCTIVELY HOME > Inside, value-added details like soundproofing, quality build materials, high-polish design finishes, and intelligent suite layouts ensure both an inspiring life and lasting value. Quality in selection of materials, and proper installation also helps to prevent maintenance further down the road. And if past projects from the Airey Group and Allaire Group are any indication, attention to details like these will deliver solid value, and a strong legacy for everyone who chooses to live here.